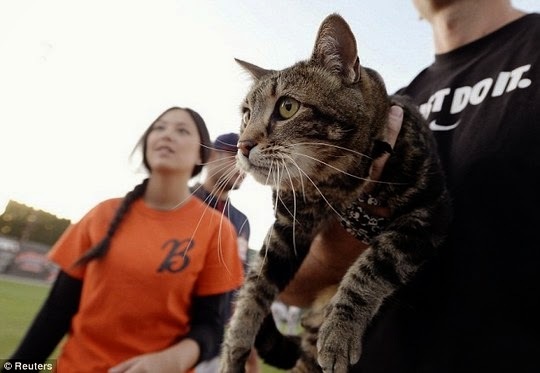 Tara the cat was the star attraction at a Bakersfield Blaze home game at Sam Lynn Ballpark in Bakersfield, California. 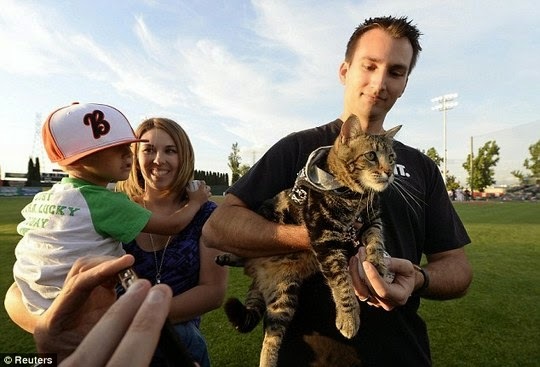 She was allowed to toss the first pitch and was carried onto the field by Roger Triantafilo, whose son she saved from a dog attack earlier that week. She's been quite the local hero ever since. 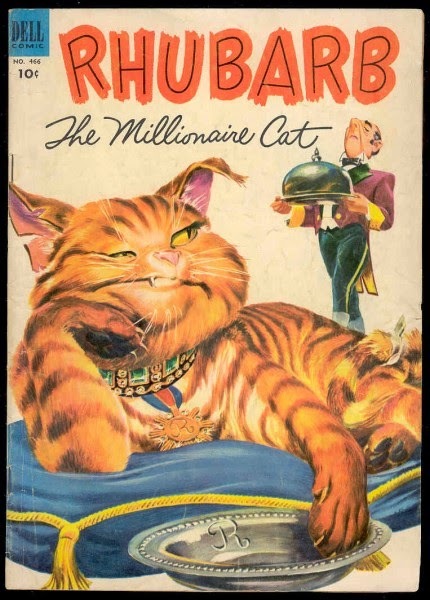 In conjunction with Underrated Treasures Day, I'd also like to introduce you to Rhubarb: The Millionaire Cat, a comedy from 1951 about a feline inheriting the ownership over a baseball team. Based on the novel by H. Allen Smith, Rhubarb: The Millionaire Cat is mostly unknown these days, but it's still a fun and easy movie for a rainy Sunday afternoon. I remember that cat. It was totally awesome the way it fought off that dog. My cat likes me, sure, but I'm well aware she'd never go that far for me. What a great blog? I enjoyed the read very much. I used to have a cat (pictured) who was diabetic so she used to travel quite a bit here in the UK. Looks like my Bones!! Same coloring but not a big. Never heard of Rhubard. Thanks for sharing your pick for the Underrated Treasures Blogfest. Haven't heard of Rhubarb. Sounds like it might be a fun movie to check out. Tara is a super hero. Have a marvellous Monday. My mom is a lover of classic movies and I watched a lot of them with her when I was a kid, but I've never heard of Rhubarb. Then again, my mom was not a baseball fan, so maybe she just skipped this one! That is a great cat story but I've never heard of that movie. It sounds really, really different. We all love that Tara the hero kitty! Wow, never heard of it! Really underrated then. Aw, what a great cat and certainly a little hero!! 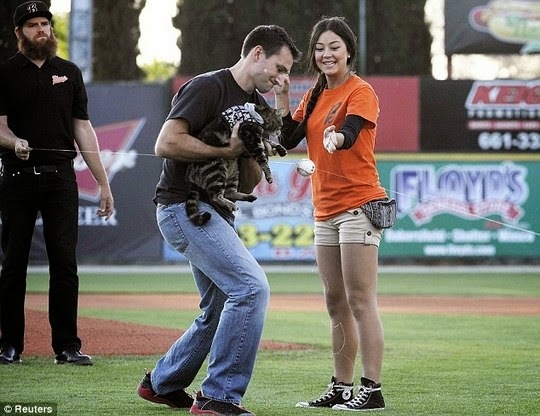 I have never seen a cat pitch before. That's awesome. What a heroic kitty! And a patient one, hanging out like that. Took out that dog with ease, awesome indeed. wow! That is so great!!!! I remember posting about this cat! Adorable shot of a very handsome cat ~ thanks for your visit and comments! Rhubarb sounds like a fun one. I wonder how they did with a cat as the protagonist? Tara is awesome, and we all love her! Tara est un très joli nom pour une minette. Wonderful cat. Amazing what they can do. I like the sound of that film too. Supper suppose to be super ;o) LOL! I just came across your blog on bloglovin', and I am lovin' this blog! haha. It is amazing how the cats in your pictures seem to have personalities that you would expect from each place. J'avais vu la vidéo de ce chat qui a défendu son petit maître, c'est admirable en effet ! "Le chat millionnaire" ... tout un programme !